Here's a shot of the cooler from the front. Hopefully it will catch enough air to keep the transmission cool. Slipping it into neutral will help cool things down when it's standing still. Pay no attention to the hairy knee in the photo – it's just the old guy lying down to take the photo. I have some cheap hardware store bolts in there for now. I'm making a shopping list of stainless bolts needed before final assembly (after paint) from MMS and these are on the list. Here's a shot of the final install with line routing. The banjo fittings and braided stainless lines really make this a clean install. Now I just hope it works! John from MMS is sending a piece of stainless screen to keep the crud out of the cooler. I'll cover that when it comes. I just realized that I never showed a shot of the top of the cooler. It's open on the top and the air flows through the cooler upward. The scoop is just to funnel a little extra in at speed. 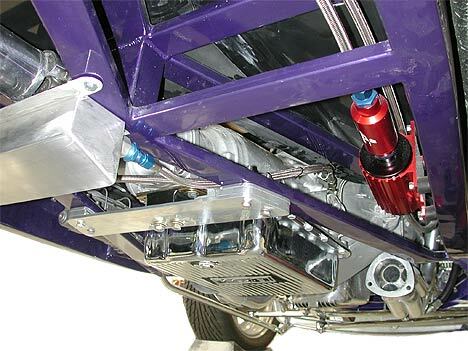 The driveshaft U-joint will also create a little turbulence that may help with cooling. 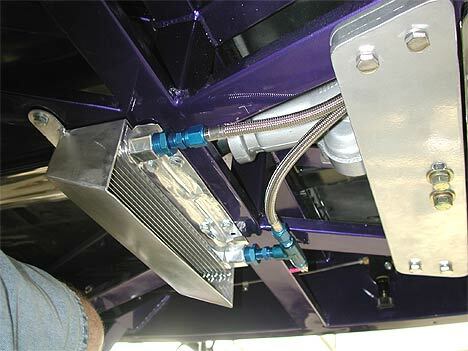 There's no air restriction of any kind and the only part of the cooler that overlaps the frame is the front mounting lip.